Making really, really good espresso is tough. You need to put in a lot of time, learning and patience to get top results. You’re going to need freshly roasted, awesome quality coffee (we know where you can get some). Not to mention a good home machine and decent (read expensive) burr blade grinder. You’ll also need to be accurate, passionate and keep your mind and equipment clean to get the results. Beware, this way madness or Nirvana lies…Breathe in, breathe out. Put yourself in that happy place. No one likes you or your coffee when you’re like this. Take out your group handle. To get the tastiest flavours from your espresso, make sure it’s clean, warm and dry. Purge the shower screen. Running the water through for a few seconds will ensure the water temp is spot on and clean for the shot. Throw your group handle onto your set of scales and tare off. This will let you control the dose to a tenth of a gram, making it nice and easy to reproduce your results when you find that coffee nirvana. It’s time to grind those beans. Investing in a really good quality burr grinder is the perhaps most important step in producing great results, as you want to be able to control particle size and dose. Grind the coffee into the centre of your handle and make sure it is nice and evenly spread. Put your handle back on the scales to check/correct your dose. There are many different basket sizes out there but generally a good starting point is 19-21g. Distribute. They’re a few different ideas about the best way to create an even bed of coffee, but start off by horizontally tapping your handle with your hand to even out the surface. Ok, pick up your tamper. Have you named it yet? Make sure your tamper is a perfect match for your basket size. The tampers supplied with home machines are often cheap and nasty, so you might consider investing in a professional one. Now, grasp the tamper and press down on the basket, making sure it’s flat and even. You want to apply about 15kg of downward force, which is a difficult concept and not something you do every day. We think of it as the amount of force you’d use to squeeze an extra bag in a full bin. If you really want to geek out, grabbing some bathroom scales and double checking may be a good idea. Grab your scales (not the bathroom ones!) and put them up on the drip tray. Place your cup on and tare off again, setting up to measure your shot length in grams. If the coffee you’ve bought doesn’t come with a recipe, using a ratio between 1:1.5 and 1:2 will be a good spot to start. What on earth does that mean? The ratio is a proportion of dry coffee to wet espresso. Our first ratio with a 20g dose would mean we are getting a 30g espresso (20 x 1.5), where our second ratio would yield 40g of espresso (20g x 2). Controlling this variable is crucial to getting the best flavour from your espresso. Ok you’re ready, cup’s ready, coffee’s ready, time to insert the handle and press “go”. You want to start the extraction as soon as you put the handle in, leaving it in contact with the hot shower screen is a guaranteed flavour wrecker. Watch your extraction, it should begin with a drip, not a gush or spurt, the drip will build to a gentle stream. The entire show from start to finish should be between 25-30 seconds. 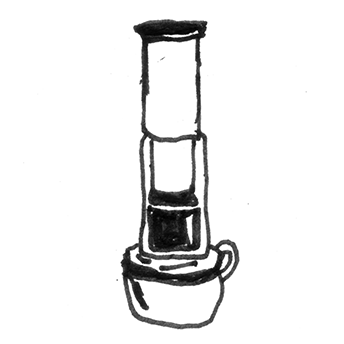 A relative newcomer to the list of brew methods, the AeroPress allows the user to truly dictate the terms of the extraction. Tweaking grind and pressure can deliver a broad range of unique cup profiles, helping you to squeeze all the best bits from that tasty light roast you’re rocking. (Or if you’re adding milk and want a stronger brew, an espresso roast if you like.) Total immersion baby! This one’s really fantastic for the home. Place the filter inside the black filter cap and rinse with hot water; this will remove any paper taste from the finished cup. Weigh out 14g of coffee using your digital scales. Stick your water on to heat up. 92-96 degrees is the sweet spot – with a conventional kettle it’s best to let it boil and then sit for a minute or two. We sell some pretty swish temperature controlled kettles here if you want to up your game. Lock the black filter cap in place at the base of the brewing tube. Grind your coffee to a medium particle size – think about halfway between espresso and plunger. Place the freshly ground coffee into the brewing tube. Place your brewing tube on top of your chosen brew vessel. Pour 200ml of the prepared water into the tube and quickly agitate the coffee and water with your stirrer. 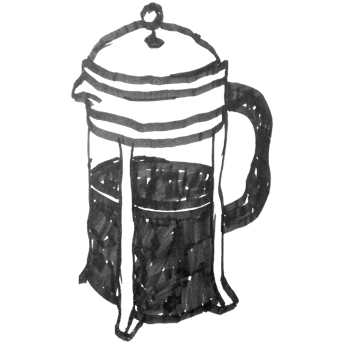 Place the plunger on top of the brewing tube and work in slightly, creating a seal and preventing the coffee from running in to the cup. Hit “go” on your stopwatch. Killer brew will be in T minus 60 seconds. Hold on Major Tom. Remove the plunger now and give it another agitation. Then replace the plunger once more. Push down using gentle pressure while saying “one elephant, two elephants”…. until there are say 10 elephants in the room. NB: If you like your brew stronger, try grinding a bit finer or brewing for slightly longer before adding more coffee. For those seeking less acidity, espresso roast coffee will deliver a more ‘traditional’ cup profile. The pour over style produces a cup of extreme clarity and roundness of body. Filtered water is heated to tailored temperature and added to the grounds and filtered down to the cup below. Of all methods this is perhaps the most straightforward but the end result is one of our favourites. Place the conical filter in your cone and give it a quick rinse to get rid of any papery flavours that may be there. Stick your water on to heat up. 92-96 degrees is the sweet spot – with a conventional kettle it’s best to let it boil and then sit for a minute or two. Weigh out 12grams of tasty light roast coffee and grind to a medium particle size. Place coffee in the filter and dig a small hole with your finger as though you are planting a seed. Place your cone and vessel on to your scales and tare them off, letting you weigh out the water as you’re brewing. For this recipe we’re rocking a pretty standard ratio of 12g coffee to 200g of water (60g/litre). Start your timer, then slowly and gently introduce 50g water into your little “seed hole” and check out the coffee as it blooms. This stage helps the coffee degas helping you to get all the best bits into the cup. Some baristas like to give a good stir during the bloom to aid this process – we’ll leave that one up to you. At the 30 second mark the coffee should have bloomed and then begun to sink again, meaning it’s time to give it a bit more water. You can try pouring 50g in 30 second intervals, two 75g pours or just top it up to the full 200g final water weight. How you pour in this stage will tweak final cup quality. Weigh out your coffee – we’re gonna be rocking that same 60g/Litre ratio here, meaning you’ll need about 30g for a 500ml or ‘2 cup’ plunger. If it’s your first time using a new plunger it doesn’t hurt to measure in grams how much water it holds so you can calculate how much coffee you’re gonna need. Stick the plunger on your scales, slap your timer on and start introducing the water. You want to make sure you’re evenly wetting all the coffee in there and that nothing is getting left behind, this may take a bit of practice when you’re first learning. Some people like to give a bit of a stir at the start and even sometimes in the middle of the brew – this is designed to make sure all of the water is touching all of the coffee. At the 4 minute mark it’s time to give the brew a final stir, breaking the crust and making it easier to press down with the plunger. Now, line your plunger up and apply slow steady downward pressure, forcing the grounds to the bottom. If it gets too hard, you can stop and press again. 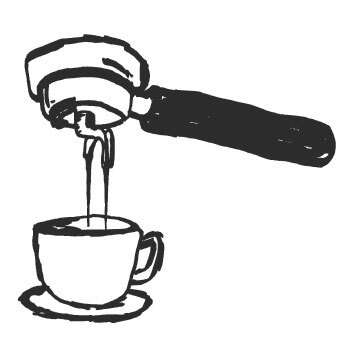 You want to do this with a steady hand and consistent pressure, if you try and do it too quickly coffee grounds will escape up the side of the plunger and you’ll be left with gritty coffee – no-one likes gritty coffee. Immediately pour the coffee into your favourite cup. If there’s more brewed coffee than you need, pour it into a serving vessel for later as leaving it in the pot will cause the coffee to overextract, turning a good story bad very quickly. Extra points for pouring through a fine mesh strainer, helping to remove the fine coffee particles from the coffee you’re gonna drink. 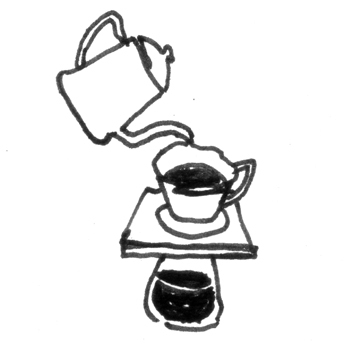 Or –trick of the trade – use a pour over filter.